ACC Minister Nick Smith has confirmed the Government will move to allow private insurers to compete with the Accident Compensation Corporation for a share of New Zealand's work place insurance market. ACC is being privatised by a manufactured crises against the advice of Pricewaterhouse Coopers for the Australian Insurance shark industry who stand to make a $200 million killing and NZ, you’ve let John Key do it because you like him and don’t want to spoil your infatuation. This is being dropped a week out from Christmas to avoid attention, the 2011 privatization agenda is no longer secret, it's out in the open and the spin job necessary to con citizens into privatizing their few remaining social assets has begun. ...one would hope more citizens will start to question Key's direction for this country more seriously than some claim of a non-defined 'change'. But John is such a nice man! He wouldn't lie to us would he? Ha ha ha - sick to my gut. As a business owner they inspire no confidence in me. Instead of true long term vision they serve up luke warm - short term based (stupid) policy. They simply don't have the intellect (or bravery) to craft progressive ideas that may see us succeed in the future as a nation. Nothing to see here - yawn. The left lies again. This is NOT the privatisation of ACC - anybody who says that is either dumb or lying. ACC will still be around to cover non-work place injuries. Its a dog whistle word. ACC isnt being sold. ACC is losing billions, changes are needed. Why can I not negotiate my work place cover with another provider? why cant I have that freedom? Bomber, they will roll over and take it - with a few complaints here and there.....most people will soak up everything the Harold and TV news tell them and if they think they can save $10 in the very short term, they'll be convinced it's the dogs bollix! New Zealanders - you deserve everything you get! 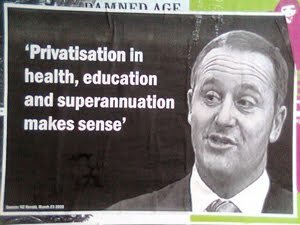 Opening something up to competition is not privatisation -- comeon bomber, remember your 6th form eco? This is really bad. It's actually all in the Herald Article. The government sets a bar of financial sustainability for ACC, then won't let it use the most obvious measure - price, levies - to meet that measure. Then it makes it compete with the global insurance industry, pretending the danger is ACC having an "unfair advantage" by "cross-subsidising" its "products". Global insurance has all the resources it needs to play by whatever rules until ACC chokes to death under the vicious cycle of National Party governance (have you noticed how all the post shops have turned into Soviet bread-queues this year?). When service is so bad, of course, ACC has to be sold off. And the result? The minimal raise in ACC levies we might experience to keep a properly regulated and resourced publicly-accountable service for everyone will be what - tripled? quadrupled? - by private insurers who will declare how lucky we are to have anyone underwriting such a small population at the end of the world And their real customers are their shareholders, anyway. I love the new angry scot - scot, why should NZ whore itself out to your evil maggot mates in the International insurance industry? Do we really want the pus that is the american insurance industry in NZ? Doesn't allowing their grip to sink into NZ make you a quisling scott? Well I would very much prefer that a company makes a profit than fund huge losses as a tax payer. Here is my personal problem with ACC. I work in the construction industry. But I spend 85% of my time off site - usually in my office. But i am levied based upon the fact that its a construction company, irrespective of my role being low risk - its an office job!!!!! But as a monopoly it can do what it likes. Why cant I have choice? I am an American citizen now living in NZ. I had a hip replaced this past year in NZ. I carry Southern Cross insurance so was able to do it on my own. The total cost was $23,000 plus dollars, of which I paid 0 - aside from my premiums. I have a friend in America, a teacher in Utah, who at the same time had a hip resurfacing done - a far less intrusive procedure. He had insurance which cost more than mine, yet covered only a portion of his bills. His cost was $47,000 U.S. Through out my recovery, six weeks, I had only to focus on getting better, my friend had constant worries about money, bills, and how he was going to carry on. The insurance industry simply rapes and pillages all across America, driving up costs and worry. Simple as that, we do not need it here. While ACC is not enitrely perfect, it is a better suystem than that of private insurers. If the market was opened up to private insuers there would be the same flexibility given as in any contract where they may contract out of certain provisions that ACC cannot all for the sake of cost. What we gain in pricing we may lose in quality. It should also be noted that what the media and politicians advertise about ACC being cost ineffective is only partly true. The Court Report on TVNZ 7 explored this issue and replied to critism by stating that if ACC wher looked at from a year to year basis it would be seen as very profitable, it is only that politicians look at ACC's 40 year future forecast. I have never seen the NZ Herald report that before.